This book is an unusual mix of fiction and nonfiction. 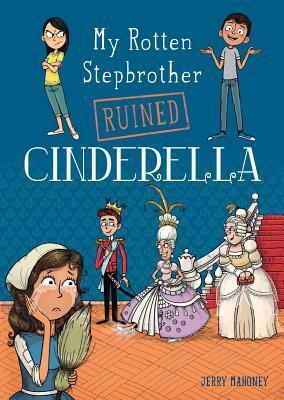 The story revolves around a young girl named Aurora, her brother and sister, and their teacher Dallas. They live on an icebound earth that requires them to spend much of their time looking for fuel to burn to keep their tribe alive. On one such trip, they find their way into a city where they come across a library. In the basement of the library, they discover a bunch of books which they are excited to report as fuel. But they do take the time to scan each book into their computer so the knowledge isn't lost when the books are burned. While doing this, Aurora comes across a book about volcanoes which interest her so much that she sneaks off and reads it. The rest of the book is a combination of story and fact. 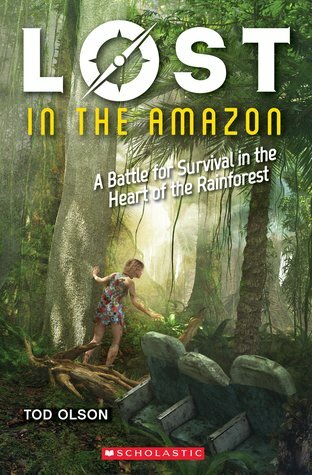 Aurora is so excited about what she's read and the possibilities for helping her tribe that she tells her companions all about what she has learned. The reader then learns about types of volcanoes, how they are made, types of eruptions, and other interesting facts about volcanoes. But Aurora's excitement about volcanoes makes her a bit careless of her responsibilities and leads to the others getting really mad at her. And the computer keeps blocking her from accessing additional information. 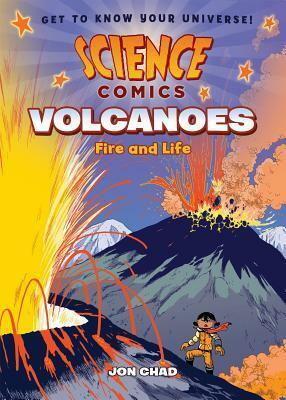 This Science Comics series is a fun way for young readers to learn about real life topics combined in a format that they love. The story mixed with the facts can be interesting. Although I would have liked more background about the characters and their situation. I was a bit confused at times. But this won't stop children from enjoying the book. I really quite enjoyed this entry in the Science Comics series. 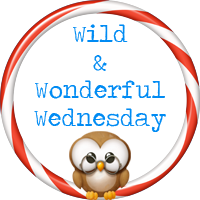 The combination of a fictional story about a young bat who is injured by a human tourist with factual information about bats makes for an interesting read. The efforts of a young girl and a vet to help the young brown bat heal complement the interactions of the different kinds of bats. 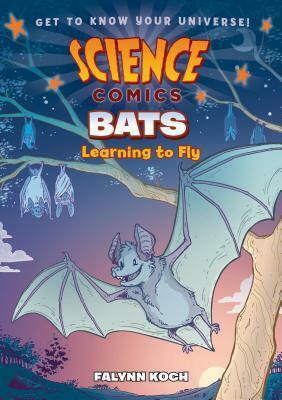 Lots of fascinating information about bats, how they fly, what they eat, where they live, provides plenty of great facts for eager young readers. The graphics are attractive and accurate, including the scenes with the bats interacting (shown right-side up, but clearly shown as upside down). For students who enjoy graphic novels and learning about interesting factual topics this series is a great boon. This series is also a great way to encourage students who favor either fiction or nonfiction into expanding their horizons. One of the things that I especially enjoy about Jennifer Nielsen's books is how quickly she gets into the action. Not only do I enjoy that, but so do young readers, especially middle grade readers. If a book isn't interesting right off the bat, a lot of students won't stick with it. 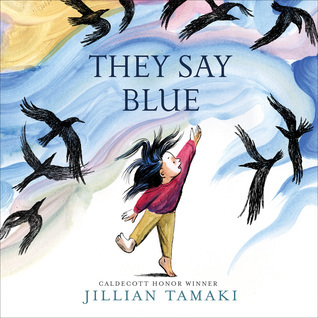 While this book is historical fiction, a genre that many middle grade readers aren't very interested in, it doesn't read like a boring history book at all. In fact it reads more like a thriller. One morning Gerta wakes up to discover a wall shutting her off from her father and brother. She's left in East Berlin with her mother and her older brother, Fritz. Four years later, Gerta still can't help staring at the wall and thinking about what's on the other side. And seeing her brother and then her father for the first time in four years is exciting but also dangerous when a East German soldier spots her doing it. It's also baffling. Gerta's father is dancing? Eventually Gerta figures out what her father is trying to tell her and finds the perfect place to build a tunnel. But is it worth the risk? After Gerta's friend's brother is killed trying to escape, Gerta isn't so sure. Until it becomes clear that her family has been marked by the Stasi, the East German Secret Police, and have very little to look forward to in the future. With her brother's help, Gerta works to build the tunnel. But with so many eyes on them, is it even possible to get the tunnel built? And even if they build the tunnel, they have little time remaining before Fritz must report to the military to serve. Can they keep their secret long enough to escape? And will their mother come with them if they do? Nielsen's written a real page-turner. I couldn't wait to find out how things turned out for Gerta and her family. 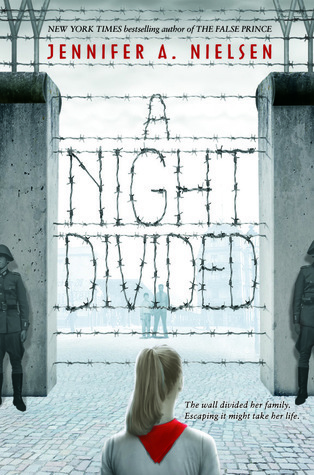 Not only is this an exciting book to read but it's also eye-opening in the historical details it provides about living behind the Berlin Wall. Another great book from one of my favorite authors. Jaundice and Kale truly live up to their names. They prefer to stay home, eat cheese sandwiches, read from a dictionary, and darn socks. They also have very specific rules to live by. But when a mysterious voice at the door promises a surprise, they violate one of their rules and open the door to a stranger. They are repaid by being kidnapped and taken to sea by pirates. This throws off Jaundice's and Kale's routine's but they have no choice but to serve as deck hands and galley servants. They discover to their surprise that the ship's captain, Delilah knows their parents. This leads them to take a huge risk, much to their own surprise, in order to, hopefully, rescue their parents. But being new to the whole thinking up and executing plans things don't go quite right. I can relate to these two girls who really aren't interested in adventure, but do manage to make some friends along the way. The very absurdity of the book is what gives the book its wry humor. An entertaining, quick read. 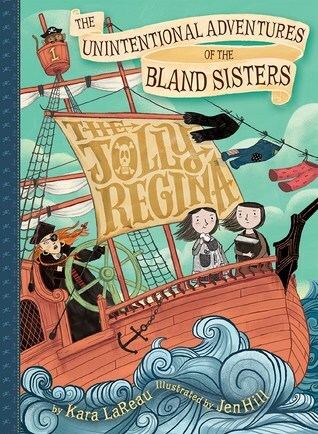 Once again the Bland sisters are sent on an adventure by their well-meaning adventurous parents. 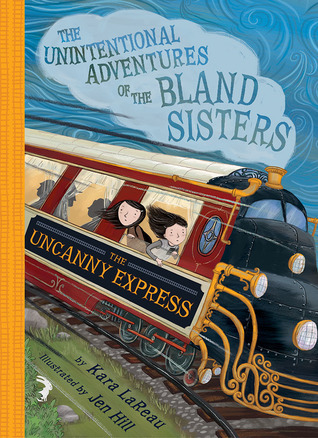 This time they arrive at the train station to pick up their Aunt Shallot, only to be swept into an adventure involving magic, unusual passengers who all seem to be hiding something, a famous detective, a missing aunt, and marshmallows on the tracks. As Kale and Jaundice try to cope with being away from their nice, boring life at home, they learn about magic and detective work. Kale's love of cleaning and Jaundice's full pockets come in handy as the girls endure their second adventure. The dry wit and unusual nature of the main characters makes these books rather entertaining and a quick read. For those familiar with Murder on the Orient Express, similarities exist but have been turned on their head. 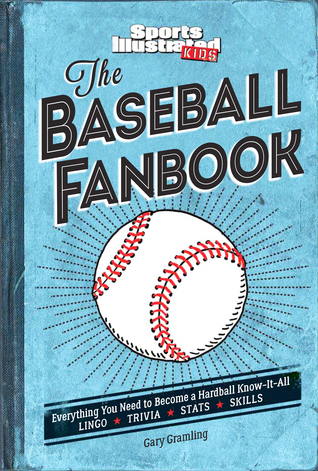 The next book in the Fanbook series from Sports Illustrated Kids, The Baseball Fanbook has all the nerdy-cool insider knowledge that fans ready for next-level, in-depth stats need to know to impress their friends, family, coaches, and any season ticket holders they may meet. Tailor-made for baseball fanatics ages 8 and up who know the basics of the sport they love, may play it, and are looking to become super fans, this new fanbook is filled with fun trivia, unique lingo, and illustrated behind-the-skills how-to's. Chapters include Team Tidbits (salient baseball facts about every MLB team), Think Like a Manager (essential strategies to understand), He Reminds Me Of (compares current players to legendary greats of America’s favorite pastime), and much more! The Baseball Fanbook provides a fantastic collection of facts and information about America's national pastime. Divided into sections the book looks at famous records, obscure facts, skills to master, running a team, player comparisons, team descriptions, and baseball lingo. The book's design makes it an attractive book indeed for those who love the game. While I am am not a baseball fan, I still found the book full of interesting information about players, teams, and the game itself. I learned quite a bit about the game. With lots of photographs, short paragraphs, and infographics this book is bound to be a favorite for baseball lovers. After thoroughly enjoying Giants Beware! it was a pleasure to move on to book two. 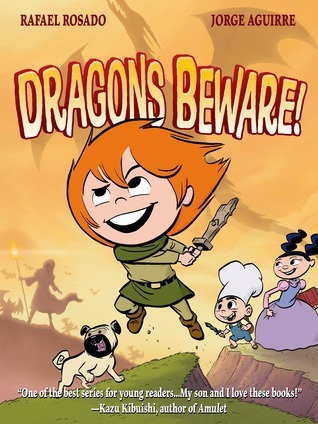 Once again Claudette and her friends set out to save their town, but this time they are following her father into a dragon's den. Claudette's fieriness makes for an entertaining read, but what I love most about this series is the way Claudette doesn't succeed without her friends' help. While neither Marie nor Gaston are fighters the way Claudette is, they both possess skills and talents that come in very handy. I love the fact that Gaston loves to cook and is very good at it, but he also has a flair for magic. Marie loves to practice princess skills, but she's intelligent and diplomatic. Only together can the three of them face the dragons and a wicked sorcerer to boot. 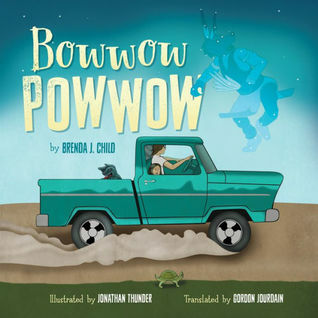 The book is full of both humor and action, but has strong themes of friendship, cooperation, and courage. The illustrations are awesomely enjoyable. A great graphic novel series for middle grade readers who enjoy action and adventure. 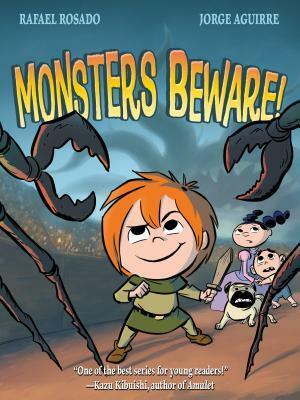 In Monsters Beware!, the third and final book of the Claudette graphic novel series, Claudette is put to the ultimate test. With her honor on the line will she learn that there's more to a fight than just winning? Jennifer Nielsen does a great job of creating fiery characters who almost immediately find themselves in trouble up to their eyeballs. The Traitor's Game is no different. But this story follows the fortunes and misfortunes of two main characters, Kestra, the daughter of a very powerful man in the country of Antora's government, and Simon, a member of the resistance group called the Coracks. After three years in exile, Kestra is on her way home when she and her entourage are waylay-ed. With her servants' lives on the line, Kestra is forced into agreeing to help the Coracks retrieve a magical item supposedly hidden at her home of Woodcourt. Simon and a girl named Trina are sent with Kestra to ensure that she follows orders. But Kestra has plans of her own and they don't involve helping traitors and betraying her own family. But as so often happens the plans of Kestra, Simon, and Trina don't go off without a hitch. The tension between Kestra and Trina threatens to derail all their plans and Simon's feelings about the girl he used to know aren't all hatred. The point of view switches between Kestra and Simon, giving the reader a glimpse into the mind and heart of each as they struggle to accomplish their objectives. The tension between Simon and Kestra goes back and forth between attraction and loyalty to their respective causes. 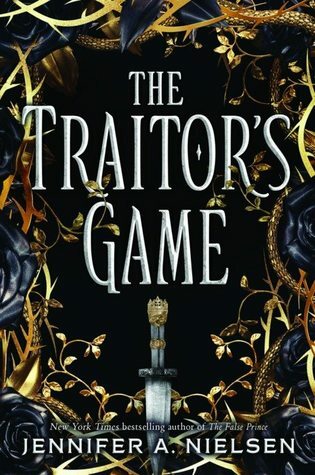 But as Kestra faces her father again and even Lord Endrick, the evil ruler the Coracks are sworn to destroy, she starts learning things that shake her faith in the life she's always known. 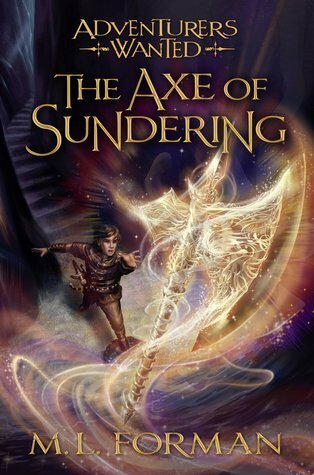 Finding the Olden Blade, which offers the only hope of defeating Lord Endrick, offers Kestra a chance of rescuing her servants and helping her country. But both Kestra and Simon are walking a very fine line between loyalty and betrayal. Is there any way out of this mess that leaves them both alive? Nielsen has written an action-packed, thriller of a novel. Kestra and Simon are both sympathetic characters that I found myself caring about, even though they are on different sides as the story begins. But the author does a fantastic job of writing a compelling story that I read quickly with lots of twists and turns. There are hints about where the story is going to go but interestingly, the characters know more about certain things than the reader, which makes the reveals all the more of a shock. I can't wait to read the next book! Note: There is some violence in the book because of the nature of the story (revolution). There is also some kissing.